Coming just sixth months after the attacks on Pearl Harbor, the U.S. victory at Midway is credited with changing the tide of the war and putting a halt to Japanese expansion in the Pacific. The 76th anniversary of the battle has been commemorated with ceremonies throughout the U.S. and Japan. 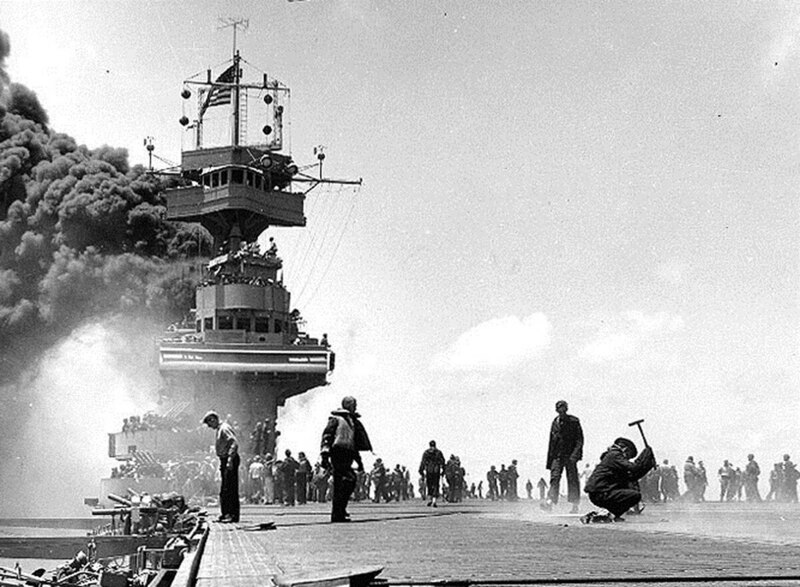 4 June 1942 -- #OTD the WWII Battle of Midway begins. In the initial aerial attacks of the Battle of Midway, 108 Japanese planes strike the atoll. U. S. Navy aircraft sink four Japanese carriers, and the enemy abandons the planned invasion of the atoll. In this video, "The Battle of Midway," the American public saw for the first time color footage of troops engaging in battle. Find out more about the battle in our WWII Gallery or visit our Virtual Tour: http://www.virtualusmcmuseum.com/WWII_7.asp Video by U.S. Archives: On the Japanese aerial attack on Midway Island and U.S. ships in the area. Shows activities before, during, and after the attack. Marines parade on the island and bombers prepare for a flight. Japanese planes attack the island, setting fire to a hangar, a ship, and other targets. Carrier planes take off and Japanese planes attack ships. Several planes are downed. Shows damage on the island and dead and wounded men on ships and shore. The anniversary comes as a new blockbuster action film centered on the battle is set to start filming this summer. “Midway” will star Woody Harrelson and Mandy Moore under the direction of German filmmaker and “Independence Day” producer, Roland Emmerich. The film is set to follow the real soldiers and aviators who delivered the American victory at Midway. It will shoot in Hawaii and Canada beginning August 16, although there’s no word yet on when the movie will appear on the big screens.